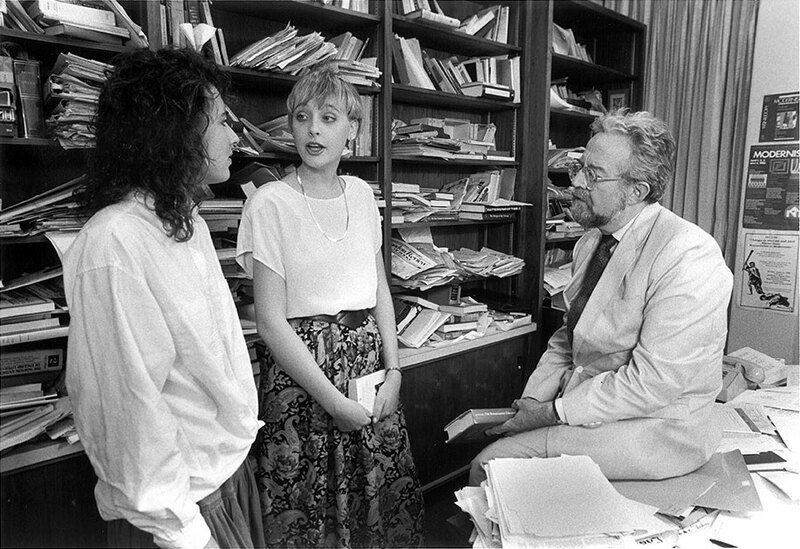 Professor Ricardo Quinones meets with students in this 1988 photo from the CMC public affairs archives. In 1975, Quinones was named the Josephine Olp Weeks Professor of Comparative Literature. He won the Glenn R. Huntoon award for exemplary teaching two years later. Quinones became founding director of the Gould Center for Humanistic Studies in 1987, which now has a distinguished lectureship in his name. For several years, he served on the board of directors of the National Council for the Humanities, appointed in 2004 by President George W. Bush. Quinones was also one of the first presidents of the Association of Literary Scholars, Critics, and Writers. Charles Lofgren, Roy P. Crocker Professor Emeritus of American History and Politics, said Quinones’ commitment to CMC always stood out. Quinones grew up in Allentown, Penn., and attended Northwestern University. Originally intending to be a journalist, he was influenced by the mentorship of Donald Torchiana, a Northwestern literature professor. Quinones came to Claremont from Harvard University, where he earned his PhD under renowned literary scholar Harry Levin. Quinones’ first book, 1972’s The Renaissance Discovery of Time, is considered a standard of literary studies of the period. Novelist Charles Johnson used Quinones’ 1991 book, The Changes of Cain—an exposition on the Cain-Abel theme in literature—to influence his 1998 historical novel, Dreamer, about the life of Dr. Martin Luther King, Jr. Quinones’ last book, 2016’s North/South: The Great European Divide, was a discussion of Protestant and Catholic Christianity and its effect on economic development. Beyond his literary accomplishments, Fucaloro and Lofgren said they both admired how Quinones invested deeply in people. He wasn’t someone to just greet you and walk away. Quinones always “made a point to get to know you, he wanted to hang out and talk,” Lofgren said. Fucaloro reminisced about lively pick-up basketball and poker games during their early days as colleagues—the social side to Quinones that bonded him with professors from other departments and formed lasting friendships. “He was a literature guy, I’m a chemist. But we clicked right away,” Fucaloro said. “Thinking about our friendship all these years, how close our families became—I mean, those are the important interactions in life. Quinones died in hospice care at his home in West Los Angeles. He is survived by his wife, Roberta, and sons, Sam, Ben, and Josh, a 1988 CMC graduate. He was preceded in death by his first wife, Lolly, and son Nathaniel.